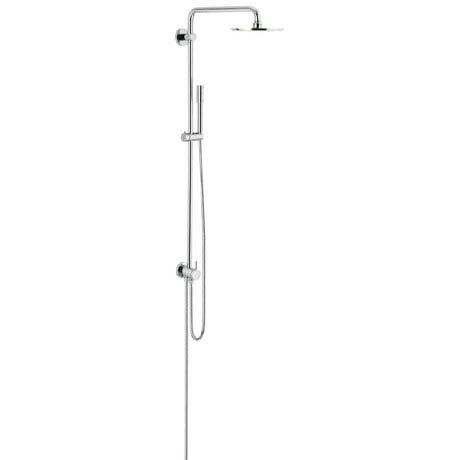 This Rainshower Shower System with Diverter is ideal for those wanting a luxurious shower. The large 210mm head shower is mounted on a ball joint arm so you can easily adjust its angle to create your personal comfort zone in the shower. The sleek shower handset is height adjustable thanks to the gliding element on the wall rail. The shower system is finished in GROHE StarLight, a scratch resistant chrome finish and features anti-lime nozzles on the shower head for quick and easy cleaning. Please note: additional images are for illustrative purposes only. Shower valve and outlet elbow not included.